Decorations have spread to the parking lot this year with wreaths on all of the parking lot lightpoles. A new reindeer was added to the balloon icon sign just outside the main gate. The 70' icon tree is located just inside the main gate in International Plaza. Several penguins are stationed around the trees in International Plaza. Along with some very large Christmas baubles. A snow angel photo prop has been added for this year. A look towards the main stage and icon tree. An elf with his airplane stationed just outside the Nole Pole Post Office. Some cool looking candy castle decorations near Nordic Chaser. Large stars hanging next to the DinoStore in Africa. Some photo props in Europa. Some cool vehicles on the roof of Vittle Griddle. 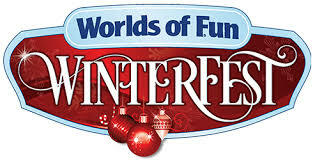 Several rides were open during Winterfest. The new Tinsel Town area. These light bulbs were huge. I really liked the new wreaths on the light poles. The sun is setting on the SteelHawk Christmas Tree of Lights.